Now we introduce our deluxe line of Amish made solid hardwood jewelry boxes. They are classified as deluxe because they are assembled with sturdy dovetail joints, and they are available in a variety of configurations. 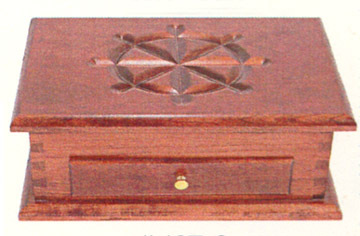 Here you see our solid cherry deluxe jewelry box with a nautical symbol engraved in the top and a drawer in the front. This jewelry box is also available in solid oak.